Charlton Athletic owner Roland Duchatelet says he understands why fans are unhappy with him, but he is not prepared to sell the Championship club. The Addicks are bottom of the table and supporters have held protests in recent weeks aimed at Duchatelet and chief executive Katrien Meire. "I have a lot of empathy for what they feel," the Belgian businessman told the South London Press. "But the conclusion that I should sell is a bit too quick." 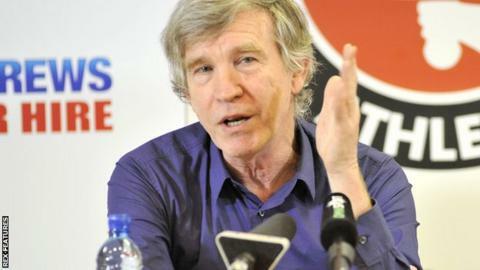 Duchatelet bought Charlton in January 2014, adding the south-east London side to his network of clubs around Europe - which includes teams in Belgium, Spain, Germany and Hungary. A section of supporters have questioned the 69-year-old's motives and expressed their anger at the turnover of managers, the club's recruitment strategy and the role of Meire in running of the club. Fans have formed a group called Coalition Against Roland Duchatelet (CARD), which has organised a series of protests at matches at The Valley. "I fully understand that people are unhappy, so I don't take things personally, and I try to do something about it," Duchatelet added in a wide-ranging interview. "I still believe we can make a big success out of this and that Charlton can regain importance in London. "Two years in such an adventure is not a long period. I still feel I have the ability to be a very big asset to the club." Duchatelet also defended Meire, describing the 31-year-old as possessing "a huge heart for Charlton", and said one of the reasons for appointing head coaches Bob Peeters, Guy Luzon and Karel Fraeye was their previous experience of working with young players. Jose Riga was reappointed Charlton head coach last month - for his second spell in charge at The Valley under Duchatelet - and the club are currently four points from safety.